Bumble bees are social insects that generally form a colony of their own with a single queen. Bumble bee colonies are usually smaller than honey bee colonies. It can have as few as 40-50 bees in one nest. Bumble bees generally feed on nectar as honey bees. These bees can sting powerfully and multiple times. They usually like to stay away from animals and humans. It is best to not kill them as their population is greatly threatened. They make for an important part of our ecosystem. But however valuable their existence might be, it doesn’t make sense for you to share your living space with them, especially because of their harmful and painful stings. But before getting rid of this insect, you should know what kind of bees you are dealing with. In this article you will learn how to deal with bumble bee infestation at your house, the difference between different kinds of bees, what a bumble bee looks like and the best home remedies to get rid of bumble bees. 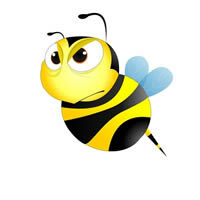 What is the difference between various types of bees? • Bumble bee: Bumble bees generally get aggressive and attack only when threatened. It usually prefers nesting underground or on loose and fluffy materials. • Carpenter bees: These are oval shaped bees. They have the ability to burrow into a service and leave three to eight inches hole. These are solitary beings. They hardly cause any damage to structural beams. Even then, the individual nests have the ability to multiply and eventually they end up destroying the surface of wood. • Honey bees: Honey bee nests are much larger than bumble bee nests. Their nests can produce close to thousand workers and can get quite heavy. These bees are known to be extremely beneficial and less aggressive. • Hornet: This species is very aggressive; hornets build paper nests that take the shape of an upturned teardrop. • Wasp: A wasp is thin and long and their legs sort of hang when they are in flight. They have a very painful and powerful sting and generally build their colonies in cars and attics. • Ground bee: This small species of wasps builds its nest underground. The depth can vary from two inches to two feet. The nests are usually build in abandoned holes and burrows. They are very aggressive and get agitated easily. • Yellow jacket: These are yellow and black striped insects. They build their nest very similar to that of a hornet. They are also known to build their nests in walls and can chew through a surface wood or a drywall. 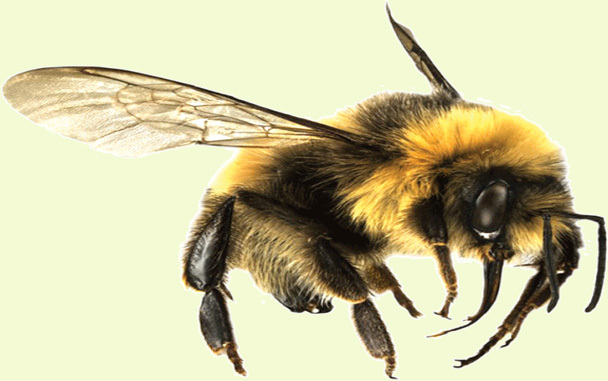 Bumble bees are fuzzy creatures with yellow and black striped bands on their body. They have a round body which is covered with soft hair, making them feel and appear fuzzy. When the yellow and black colors alternate, it serves as a warning signal. A female bumble bee’s sting is pretty painful. The warning colors can change from yellow to black, pink, white, red and orange, depending on the type of the bee. What is the lifecycle of a bumble bee? A solitary queen is responsible for starting a bumble bee nest. This queen bee emerges during the spring season and starts looking for an appropriate place to build a nest. Generally, bumble bees build their nests in old burrows and holes, usually that of a rodent’s. Mice holes are also sometimes used by the queen bee to start building her colony. She lays around 5-8 eggs which then develop into worker bees. This way the queen starts building her colony and by around mid of summer, the colony has up to 100 bee workers. What is the difference between honeybees and bumble bees? People often confuse between bumble bees and honeybees. But they are different in a lot of ways. Below listed are a few differences. • Different species of bumblebees have tongues of varied length and hence they feed from varied and different shaped flowers. All honeybees have smaller tongues and they generally feed from open flowers. • Bumble bees have small colonies, consisting of around 50-300 bees. Honey bees live in big hives, consisting of around 20,000-60,000 bees. • Among the bumble bees, just the queen hibernates and that too inside a hole in the ground. Among the honey bees, the queen, along with her many offsprings, stays in the hive and hibernates. • The queen bumble bees generally lives for a year, but the rest of the worker bees die within a few months. The honeybee queens have a longer lifespan and live up to 3-4 years. • The bumble bees have their habitat in the wild. They usually build their colonies in the countryside or in gardens. Honeybees have their own personal beekeepers, but there are some honeybees that prefer the wild. • Bumble bees make small quantities of a substance that resembles honey but is not exactly honey (at least these bees don’t treat it as honey). Honeybees are known to make a lot of honey for themselves which their beekeepers sell away or consume. • Bumble bee population is threatened, the reason being a scarcity of flowers to eat from and places to build their colonies in the countryside. Honeybees are declining as well; mainly the reason for their threatened existence is mites and diseases. • Bumble bees generally don’t sting until they are agitated, but when they do, they sting multiple times. Honeybees generally die after stinging someone because then the stinger gets barbed and that sticks to their skin. • Bumble bees do not communicate by dancing, rather they communicate by passing pollen among the worker bees. Honeybees are known to use some kind of a waggle dance to pass on information about different flowers’ locations. Now, all said and done, it’s clear that bumble bees can hurt you, or at least damage your properties to some extent. The next big question, then, is here. How to get rid of bumble bee hives? There are a number of methods of bumble bee extermination, depending on where they build their colonies (for instance, in the yard, house, garden, in the ground or the car). Tarping is a great, and environment friendly option to trap the bees, the only downfall being its risky nature. For this place, you need to put tarps on the bumble bee nests and put heavy items like stones and bricks on the sides of the tarp. This method turns out to be most effective when carried out at night. That’s because in the morning, there is a possibility of agitating the bees when you try to place the tarp. . It would be best if you wear dark clothes while carrying out this task to draw as little attention to yourself as possible. You can also opt to use a few extra hands for this so one person can place the tarp over the nest and others can place the heavy bricks all around. Attacking the source, i.e. the nest is the best way to eliminate the bees effectively. This method is helpful when you are dealing with ground bees as you would then know the location of the nest. Mint oil has the ability to kill nearly all insects, and soapy boiling water increases its potency. Mix two cups of water and 2-3 cups of peppermint castile soap and keep a kettle of hot boiling water handy. Put on some protective clothing and start pouring the soap and water mixture down the nest with a hose or a pipe. Pour the hot boiling water after this and then run inside the house to avoid bumble bee stings. The hot boiling water at will help the soap water penetrate through the nest properly. D-Force HPX is the way to go if you are considering using chemicals to get rid of bumble bees. This is an insecticide that comes in a pressurised can. Deltamethrin, a synthetic pyrethroid is its active ingredient. This ingredient paralyses the bees by attacking their nervous systems, thus killing them. You need not spray this over your entire yard or garden; you can just target the nest and spray on it. This insecticide can be used both outdoors and indoors, but you need to keep kids and pets away from it. Also, make sure to wear protective layer of clothing while spraying this. Vinegar spray is a great option to remove bumble bees from your yard and garden. Wear protective clothing while spraying this. All you have to do is mix equal parts of water and vinegar, put the mixture in a spray can, and spray it on the nest or the hive at night to avoid the bee stings. It would also be beneficial if you spray this mixture on the surrounding flowers, bushes and plants as the bees are most active there. Keep applying and spraying the mixture until you get rid of all the bees. This is an ingenious trap worth trying out. For this, all you have to do is to take a soda bottle and cut it in half. Take the sweetest soda that you can find. Fill the bottom half of the bottle with this sweet soda. Keep this bottle near the hives and the places where they are the most active (for instance, the nearby plants and flowers). The sweetness of the liquid will attract the bumble bees. Once they dive in to taste it, they will drown in the liquid. It’s possible that they’ll react quickly, flying away before drowning. In such cases, you can use any other method to get rid of the rest of the bees. Bee zappers are a convenient way to get rid of bumble bees around your house. If you spot a bee hive or a nest in or around your house, you can resort to this method. Use bee zappers to lure bumble bees towards them. Once the bees come in contact with the zapper, they are electrocuted and killed immediately. A warning: this method won’t be of any use if you want to get rid of the bees without killing them. Bumble bees generally prefer building their nests and hives in sandy and dry soil, the reason being the fact that dry and sandy soil attract female bees to start nesting there. If you spot hives under the ground, you can start watering your garden and lawn frequently. This will make the soil wet and moist and deter these bees, thereby keeping them from coming back. This is an extremely inexpensive way to get rid of the bees naturally and without killing them. IF you want to get rid of bees naturally, the best way would be to make your own bee repellent spray. Bumble bees are known to get attracted to sweet smells such as floral, honey and fruity perfumes. To make your own spray, mix one cup of odorless baby shampoo, and one drop of cinnamon oil, tea tree oil and peppermint oil. You can use either one of them or all – it is your call. Pour this mixture into a spray bottle and start spraying it on their nests and plants and flowers where they are most active usually. Citronella candles are known to be effective as mosquito repellents. They are also known to work equally well to ward off bumble bees from your home. They are a great option for getting rid of the bees naturally and without causing them any harm. Light some citronella candles in the rooms where the infestation has occurred. Keep doing this for a few days, the bees will start avoiding those places and eventually stop invading your house. Once all the bees have gone, you can get rid of their hives and nests. This kitchen spice can turn out to be lethal on bumblebees. Garlic can be used in various ways. One of them would be use some garlic in cooking oil. Soak some garlic pieces into the cooking oil and add a little bit of white vinegar to it. Make sure to add cheap vinegars as they are more acidic and will cause more harm to the bees. Mix them properly and take the mixture in a spray bottle. Start spraying on the bees but make sure you have all the protective clothing on. You can also spray this mixture down the bee hives and nests. Citrus can also be used to drive away the bees. Boil a kettle of water and put slices of citrus fruits on it. Let the water boil down to a third of the volume and then put it in the spray can. Spray this mixture on the bee hives and nests, flowers, and plants where they are usually found. Borax is the best chemical if you are looking to kill the bumblebees. All you need to do is drop down some of this chemical on the bee nests on the ground and let it take care of the issue. Borax can be and is used to kill a number of pests, the only requirement being that the bees have to come in contact with the powder. This is another spice from the kitchen that can help you to get rid of bumble bees without killing them. The best way to use this method is to sprinkle some grounded cinnamon around the bee hive and keep doing it for at least 1-2 weeks. Eventually, the bees would immediately relocate. The smells of mothballs is said to put off bees. Hang these mothballs around your garden or place them in your area where you frequently spot the bees. You can prevent bumble bees from building their hives using this method. Bees are generally drawn towards flowers and plants, but there are some plants that repel bees; mint is one of them. If you spot bee hives or nests in your garden or yard, one of the methods that you can use is to plant bee-repelling plants. These are a few home remedies that you can use to get rid of bumble bees naturally. If nothing seems to work, the best alternate option would be to call professional beekeepers and bumble bee exterminators.